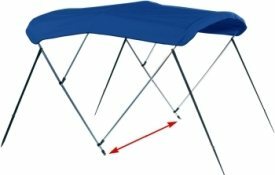 Determine the width of the bimini top by measuring from mounting point to mounting point (where you want the bimini top to attach on one side of the boat to the same location on the opposite side of the boat). Width selections below are given in 6" ranges. As long as your width measurement falls in the 6" range, your width selection will be correct. Bimini frames can "flex" 3 inches out or in (i.e. a 54"-60" width bimini assembled will measure approximately 57" in width but can be flexed in to 54" or out to 60"). Width is the most crucial measurement for finding a bimini top. While it is related to the width of your boat, this measurement is not the same as "beam" or boat width.